The Murphy Auto Museum in Oxnard is Open on Weekends! Check it Out! See over 40 classic cars, from a 1915 Ford Model T to a 1932 Plymouth Coupe Street Rod to a 1956 Packard Carribean 2 door hardtop at the Murphy Auto Museum at 2230 Statham Blvd., Oxnard. 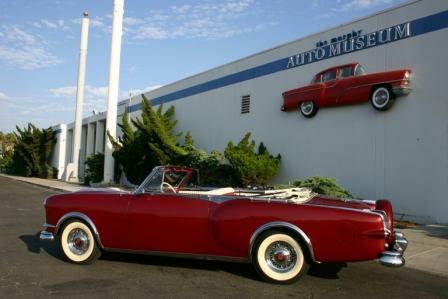 The Murphy Auto Museum was founded in 2002 by Dan Murphy, a retired neurosurgeon in Ventura, who formed a non-profit museum for the purpose of displaying automative history here in Ventura County. Donations to the museum are tax deductible and are always welcome to maintain and upkeep the 22,000 square foot facility. There is also vintage clothing on display from each decade, going back to the 1890s. Men's and women's fashons are displayed on mannequins placed adjacent to cars of the same era. There is also a HUGE model railroad on display at the museum, courtesy of the Gold Coast Modular Railroad Club. See the video below. This display is amazing and worth the visit! The suggested (but not required) donation to the museum is $9 for adults and $5 for children 12 and under. Open from 10 a.m. to 4 p.m. on Saturdays and Sundays. For more information visit www.murphyautomuseum.org or call 805.487.4333.